UPDATED, March 16, 2011 — The Catholic Church announced March 16, 2011, that Luis Campos would be released and take exile in Spain. The summer of 1994, was a long, hot summer in Cuba, culminating with the seaborne migration of about 30,000 Cubans to the United States and, in a Clintonian attempt to keep it from happening again, the implementation of the morally bankrupt "wet foot, dry foot" policy. One of the flashpoints for Cubans' summer of discontent was the "Baragua," a ferry in Havana harbor. On July 26, 1994, hijackers seized the Baragua and set sail for the United States. But the U.S. Coast Guard blocked the trip, sent the vessel — and the people on board — back to Cuba. Ten days later, on Aug. 4, hijackers tried again, but the boat ran out of gas, and drifted to shore. One of those arrested for the second hijacking was Luis Campos Corrales. He was tried on charges of piracy and "disrespect," and was sentenced to 26 years in prison. After serving time in the prison of Combinado del Este, Luis Campos Corrales was transferred to the Canaleta prison which is in Ciego de Avila several hundred miles from Campos Corrales’ home. 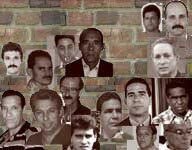 The conditions in the prison cells are not different than those experienced by other political prisoners in Cuba. Campos Corrales has been in solitary confinement, physically abused and obligated to carry out his sentence within the general prison population, which includes highly dangerous criminals. Regardless of his predicament, Campos Corrales has endured several hunger strikes attempting to reclaim his rights and to denounce the inhumane conditions in which Cuban political prisoners live. Campos Corrales has been in the Guanajay prison since July 2003. His mother, Mrs. Gregoria Corrales has call attention to the deplorable conditions of her son’s confinement and the lack of medical care for a bacterial infection which is causing Luis Campos Corrales to go blind. Last week, Mrs. Corrales provided an update about her son, who is now 41, to human rights activist Juan Carlos González Leiva. She reported that his health continues to deteriorate, suffering from bleeding hemorrhoids, gout and other chronic conditions — for which he is not receiving any medical care from officials at the Agüica in Matanzas, where he is now held.